I can count on one hand the number of Cheesesteaks I’ve eaten in my life. I’m trying to remedy this. Last week my friend told me about the Cheesesteak Grille on Sierra College by Douglas, over where the Jukebox used to be. I had no idea there was anything in that little strip mall food-wise. I told him about Milo’s, which I liked. He went there for lunch but wasn’t too impressed, so this Friday he brought me to this one to show me a great cheesesteak. We arrived at around 7 and other than a largish group that was hanging out and winding down they were empty. The menu is pretty big and had lots of different kinds of cheesesteaks. I was tempted to go with the traditional, but the Blue Ribbon caught my eye and there was no turning back. I added some onion rings and a standard soda to make it a combo. I say standard soda because they have a pretty big selection of gourmet and specialty bottled sodas & drinks. They also have many beers available in bottles as well as some on tap. 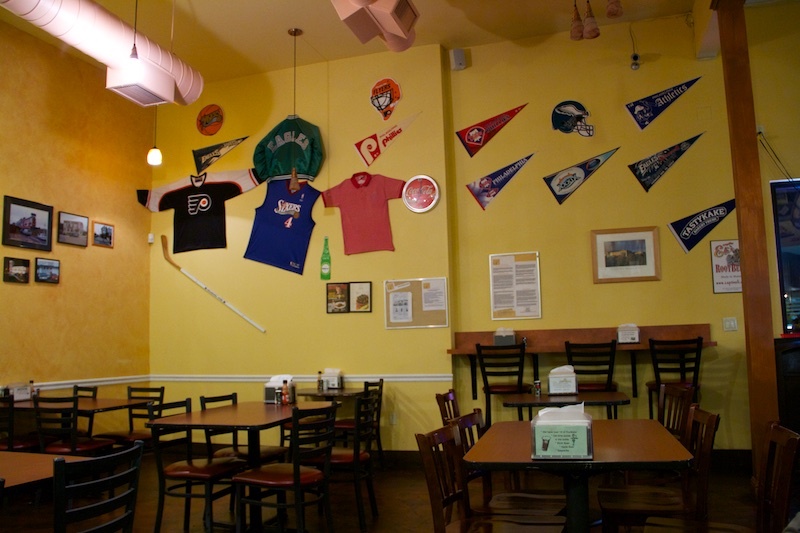 Along with the cheesesteaks, sides and beverages, they also offer a selection of salads including Greek, Macaroni, Pasta and Fruit. Those were the ones on display, the menu also listed Cesar and Cobb salads. Once we sat down we could watch the cook making our cheesesteaks on the grill which faced the dining room. I spoke with him briefly while taking some photos later and he told me about how many of their ingredients, including the bread, is brought in from Philadelphia. They’ve got Cheez Whiz, which I’ll try eventually. Some people swear by it, apparently. They also carry something called Tasty Kakes, little desert things that look like Hostess type cakes. They are obviously popular since they were sold out. Later a couple even came in just for Tasty Kakes and left disappointed. I’ll definitely check those out next time I’m here. Our steaks came out about 5 – 10 minutes after ordering and were steaming and smelled great. The onion rings were few, but very large. They didn’t serve any dipping sauces with them, but after trying one out I decided they didn’t need any. They were hot and crispy right out of the fryer and pretty tasty. My Blue Ribbon Cheesesteak was basically the traditional with bacon and a bleu cheese sauce. I chose provolone cheese, which was perfectly melted in with the steak. The bleu cheese flavor was good, but not as strong as I expected, probably because I misread the menu and thought it would be chunks of bleu cheese rather than a sauce. The Amoroso roll was soft, tasty and held the hot cheesesteak together well. My friend went with a traditional with white American cheese. He had me try it out, and it was fantastic, the cheese gave it a very creamy flavor and texture. I asked him if he ever tried one of the non-traditional steaks, but he was not interested and said the traditional was perfect and as it should be. My first two steaks were really good, but the Cheesesteak Grill is on a whole different level. I know i’ll be returning for sure. This is an easy 5 of 5. Website: I’ve scanned the menu and posted it here. The website shown on it is not correct. It points to a cheesesteak place in Nebraska.